Darker colors of the heatmap are associated with more active hotspot activities. How does the fire detection algorithm work? Land fires on the ground emit spectral signals that are characterised by higher emissions of mid-infrared radiation. Such thermal anomalies are exploited by fire detection algorithms to determine whether a particular pixel observed by the satellite’s sensor is or is not associated with a forest fire. If a particular pixel is flagged to be a fire, it is indicated as a hotspot. 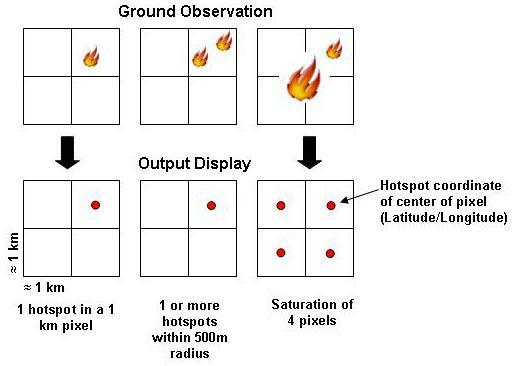 The fire detection algorithm, also referred to as a contextual algorithm, compares the values of suspected fire pixels against a set of absolute thresholds, and with values of surrounding pixels. Depending on the size and proximity of fires, they may or may not appear as separate hotspots. If the total size of fire detected is of sub-pixel size, it will appear as a single hotspot. As for active fires with size bigger than a pixel, they will appear as multiple hotspots. It is important to note that a hotspot detected does not always correspond to actual land fires. Other high temperature bodies may also exhibit similar thermal properties as land fires. Examples are gas flares and power plants. The detection of a fire depends on a number of factors. Fires with short lifespan may have started and ended in between satellite passes. Situations which cause some hotspots and smoke haze to escape detection by satellites include cloud cover, fires below forest canopy, and the relative size and temperature of fires being insufficient to mark the fire as a hotspot. The hotspots published by ASMC are observed using the NOAA satellite Advanced Very High Resolution Radiometer (AVHRR) sensor.